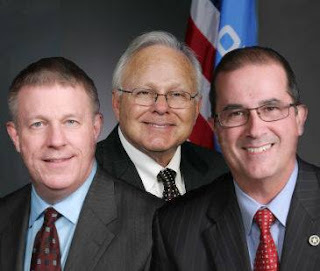 OKLAHOMA CITY – House Special Investigative Committee members Kevin Calvey (R-Oklahoma City), Bobby Cleveland (R-Slaughterville), and Tom Gann (R-Inola) reacted with concern to the resignation of Mike Romero, chief financial officer of the Oklahoma State Department of Health (OSDH). Romero resigned today in protest of illegal OSDH “compromising activity” regarding the FBI/Oklahoma Attorney General grand jury investigation into the OSDH. Romero was one of the OSDH whistleblowers who alerted state officials to illegal financial practices that led to at least a $30 million agency shortfall and hundreds of layoffs. In his resignation memo to state Secretary of Finance and OSDH Interim Commissioner Preston Doerflinger, Romero made the shocking allegation that Doerflinger “is using others, including his General Counsel, to stay abreast of the [grand jury] proceedings and to analyze the financial communications provided by me with this compromising activity.” Romero alleged the OSDH General Counsel divulged his confidential grand jury testimony to Doerflinger and others. “We appreciate Mike Romero for his integrity and courage in blowing the whistle on illegal acts and wasteful spending at OSDH,” Calvey said. “We are concerned about what appears to be an attempt to influence grand jury proceedings with a bureaucratic cover-up of wasteful OSDH spending, including spending on Information Technology (IT) services,” Cleveland added. Noting that OSDH IT services were often paid to the Office of Management and Enterprise Services (OMES), and that the former director of OMES, Preston Doerflinger, currently heads the OSDH, the three committee members further expressed concern for the integrity of oversight at all state agencies.